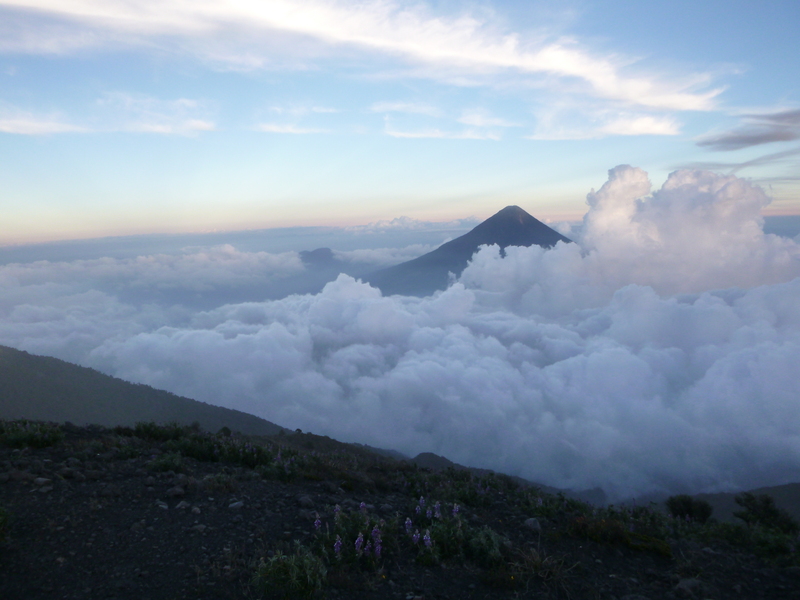 Volcano Acatenango (3976m) is the third largest volcano in central America, so when the opportunity arose for me to hike up it and camp with a view of the neighbouring active volcano Fuego (3,763) and the dormant volcano Agua, I could barely refuse. The hike began through farmland, which presented us with a vertical climb up a volcanic gravel path, with cultivated fields on either side. Each step I took I slid back half a step. It was physically demanding, and wasn’t helped with my calves burning, my heart racing and the sun burning unmercifully. This continued for an hour before we reached our first checkpoint. Here we signed a form enabling us to enter the volcanic area, and from this point on the trail did not get any easier. However, we were pleasantly blessed with tropical forest. So while clambering up, I was able to admire the exotic, intertwining, jungle trees, purple thistle flowers and dark green shrubbery. And within two hours we reached a section of cloud forest where there was distinctly less shelter but the path at least plateaued out – providing us with our first flat stint for over three hours. Needless to say, it was not to last long before the uphill climb continued apace. The path then proceed to go downhill. I was so overjoyed by this fact that I ran down allowing gravity to push me back up the next uphill section. After five hours of backpacking I was able to glimpse a distant tent – our base camp. Thank goodness. Overwhelmed, I powered up the last stretch and finally threw my huge backpack down (containing five litres of water, food, sleeping bag and clothes). I sat looking over at volcano Feurgo and as I did an almighty rumble made its presence felt. 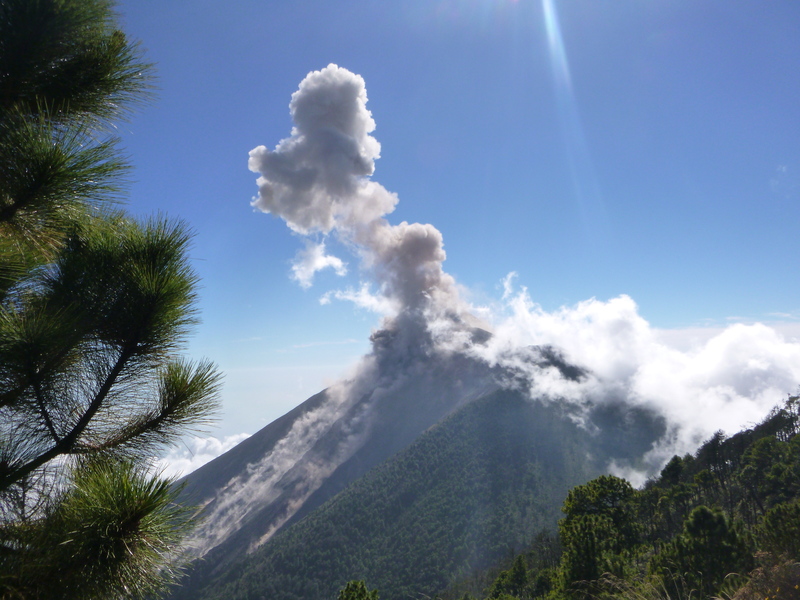 This ominous reverberation travelled across the valley bottom and reached our base camp on volcano Acatenango. Immediately following this extraordinary sound, I spied an almighty, grey plume and a fountain of rocks and ash spurted as if by magic from the top of the volcano. It was a remarkable sight. This occurred approximately every 10 or 20 minutes while we sat there catching our breath. I was mesmerised as this vast volcano (mountain feature, sprinkled with bare looking trees) caused a huge quantity of rock, ash and smoke to gush with such power that it gave off an almighty roar, causing rocks to cascade down the mountainside. I was the only one in the group mad enough to have signed up for the so-called ‘double whammy’. 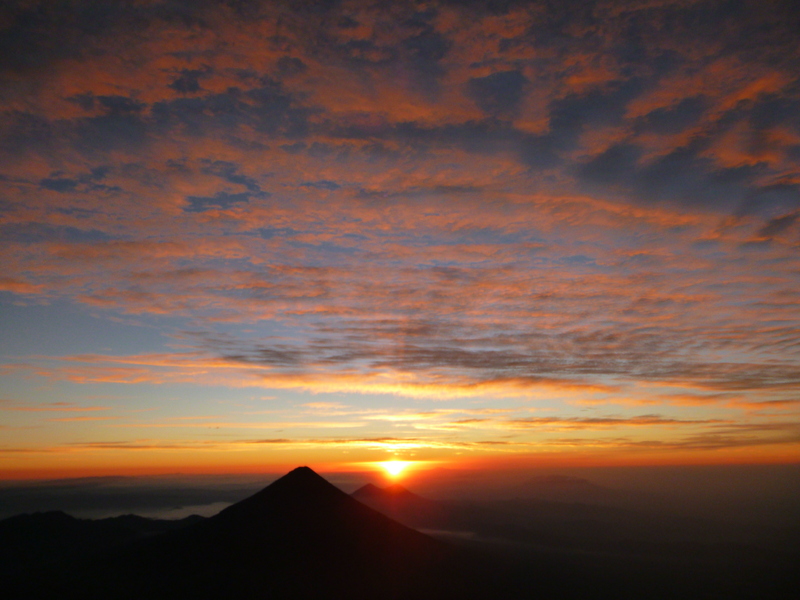 This involved trekking a further four hours up the active Volcano Fuego to see sunset. Thankfully, at the last minute an Australian couple were crazy enough to join me. We had to race against the clock to make it by 5.30pm for sunset, but somehow we made it there in record time – 1.10 minutes. (It’s normally a two hour hike.) 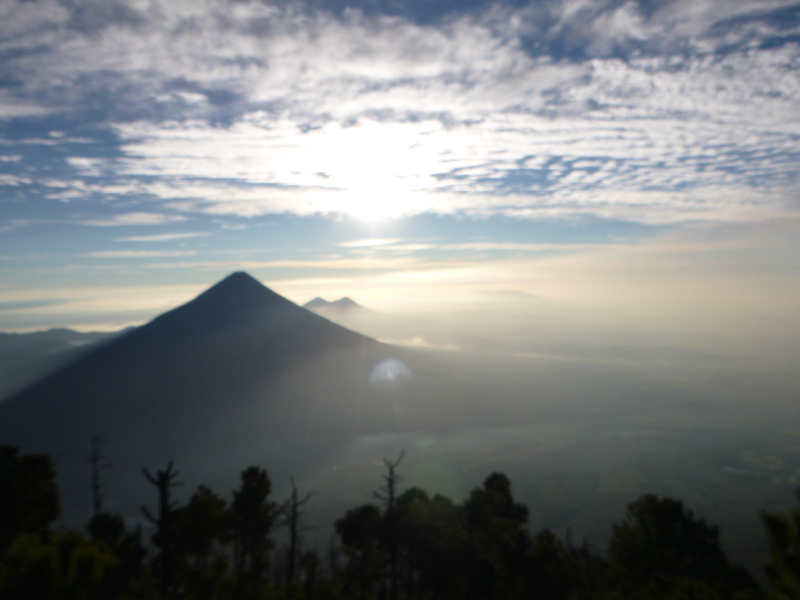 To climb Fuego we first descended Acetanango and then climbed up sandy, vegetated terrain with no designated trail. I seriously doubted that I’d make it, as my head was throbbing from the altitude, I was totally breathless and my legs were incredibly sore. This said, the last thing I wanted was the hike to be pointless. As far as I was concerned, we had to get to the top for sunset. So it was a huge relief when we were able to eventually make out the tree-line. The terrain became rocky as the summit came into view. On mounting the ridge line, the view was mind-numbingly astonishing. We were so close to the volcano’s volatile vent that we could see its eruptions so very clearly as huge boulders were thrown from the top to a considerable height before bouncing down the side . Besides being treated to this visual spectacle, our ears were greeted with the incredible sound of the rocks crashing and tumbling as they left a sandy smoke trail behind. The calm, blue ocean of the sky formed such a contrasting backdrop to the ever changing volcano. While white, fluffy clouds were clearly in no hurry to go anywhere, the grey plume was actively and rapidly appearing and disappearing before our eyes. Before long the sky was filled with iridescent orange, yellow and red streaks as the sunset commenced. Through the clouds the sun could be discerned as a luminous orange sphere lighting up the sky with the most magnificent bright reds. The surrounding dormant volcanoes looked so dramatic. As darkness descended, the volcano erupted again. And this time we saw bright orange larva spurt from the top. The orange clumps spewed with great force and then fell like a fountain all around the volcano. It was as if numerous orange fireworks had been set off. It was like nothing I had ever seen before. I have learnt about volcanoes in text books but to see one go off in front of you is something else; it’s utterly breathtaking. Naturally, the orange, florescent larva would have been extremely hot, and lethal, so we felt incredibly privileged to enjoy this grandstand view. As we descended, the temperature seemed to fall, but as compensation the stars now put on a special display just for us, carpeting the pitch black velvety sky with countless points of glittery light; not to mention the full moon, which was orange due to the ash covering it. The hike down was a little tricky to say the least. Getting our footing proved difficult on the unstable terrain. We all fell over several times, and to make matters worse (while not exactly breaking a habit of a lifetime), I lost my bearings in the dark. And then altitude sickness decided to kick in, and I began to feel dizzy and faint. But thanks to a tremendous guide I was given some Gateraid, which did the trick and we continued. We eventually made it back to a checkpoint we all recognised and from here we were able to make our way back to base camp for some hot tomato and pasta dinner – simple fare perhaps, but the best thing ever, I can assure you. I collapsed in the tent that evening and we all awoke at 4am to climb the last leg of the summit, Acetanango to see sun rise. Climbing in the dark was actually fine as I could not see the top, so I just kept on putting one foot in front of the other. The terrain again was volcanic ash so each step I took slid back a considerable amount. Nevertheless, it was so worth the climb. On reaching the top, a view of surrounding villages could be seen; their lights all blinking in the morning dark. The sky began to form an orange streak across the entire horizon. And gradually the orange rose and yellow streaks began to form. The sky became slightly lighter. As the temperature fell, those around me started to leave as the biting cold was now beginning to have a severe effect on our hands. Instinctively, I stood up ready to follow them down, but as I walked along the ridge I looked back at the view. What on earth was I doing? I could survive a bit of cold to be blessed with watching the sun appear over the orange clouds. I rushed back to my seat and gaped at the sky as its remarkable metamorphosis continued. The clouds at the bottom first changed colour and then the ones higher up became illuminated. Next the iridescent, orange orb radiated through the clouds. First as a semi circle, then revealing its entire spherical mass. It slowly but surely rose into the heavens illuminating the entire panorama as far as the eye could see. In wondrous, all-embracing daylight I finally walked back down to base camp. Thank goodness I had waited through the cold; a small price to pay for such a glorious and rewarding experience. Being so steep, the trek down from the volcano was tricky. It was less of a cardiovascular exercise and more of a challenge on our knees and muscles. Walking down I realised how far we had come. It was such a long way on such rough terrain. I practically skied down some sections, while on others I cautiously placed my feet on rocks or stable vegetation. The physically enduring climb, extreme temperatures and overall challenge were one hundred percent worth it. I really enjoyed this hike and the genuine adventure it entailed. 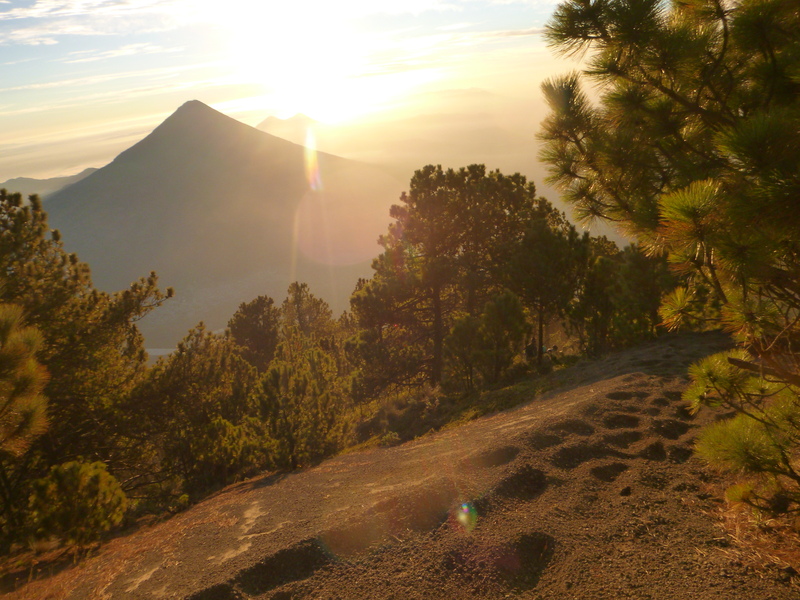 Watching a volcano erupt several times from the most extraordinary vantage point; and witnessing the most glorious views being bathed in the light from a rising and falling sun is simply awe-inspiring and unforgettable.